According to this report, the greatest fear echoing through the radical leftist corridors of power throughout the entire European Union has been how to stop President Trump—most particularly because pro-Trump populist anti-mass immigration political parties are now leading in the polls of France, Hungary, and Italy—with pro-Trump forces already being in full control of Poland—thus proving the adage that Trumpism isn’t as purely an American a phenomenon as many experts had smugly proclaimed. 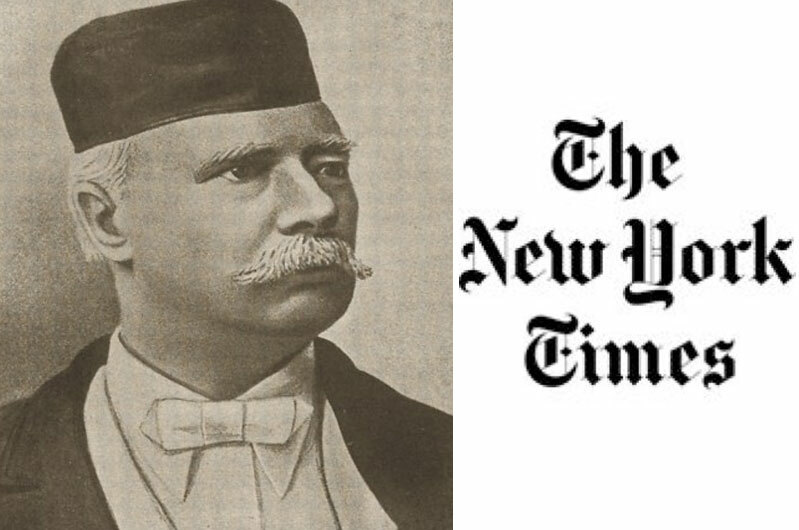 To most fully explain what Trumpism is that has these leftist Europeans quivering with fear, this report explains, one must first understand the warnings given about these leftists by George Orwell, the greatest political thinker of the 20th Century, in his celebrated 1946 essay “Politics and the English Language”—wherein he warned of leftist leaders using language not to communicate, but to hide their intentions. Orwell was confident that simple language itself would be a defense against much of what was wrong with leftist politics, this report continues, with Trump being the exact type of plain-speaking leader Orwell imagined would be the antidote to these leftists’ use and distortion of public language to hide meaning. As predicted by Orwell, this report details, plain-speaking President Trump attacking his “doublespeak” (language that deliberately obscures, disguises, distorts, or reverses the meaning of words) leftist enemies not only enthralled his own nation propelling him to victory, it entranced the rest of the world, too. 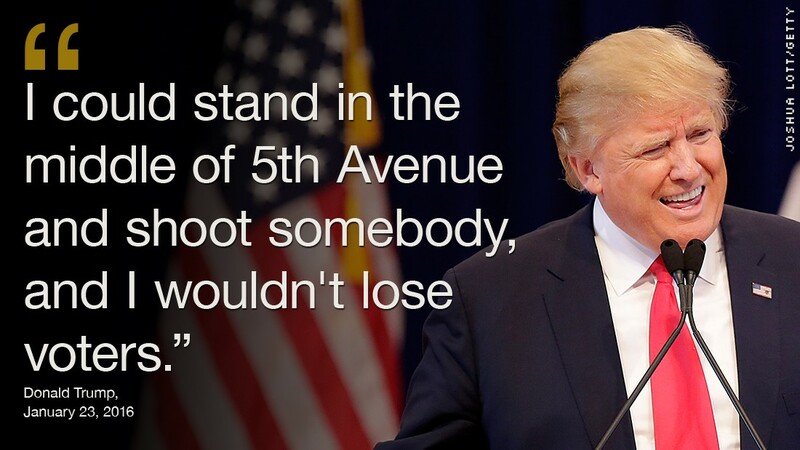 The only way a plain-speaking leader like President Trump can be defeated by these leftists, therefore, this report notes, is by demonization and dehumanizing—but whose tactics of only succeed in the minds of leftists, with those already under the liberation of a plain-speaking leader like Trump solidifying their support and admiration—thus explaining why Trump maintains overwhelming and unbreakable support among those backing him. 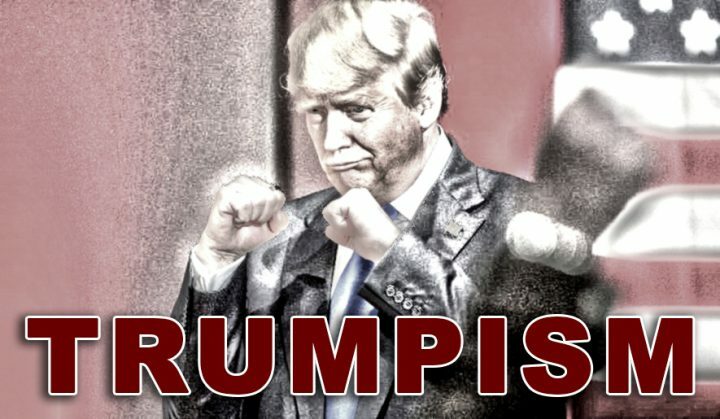 The greatest danger to those leftist forces trying to bring down President Trump by demonizing and dehumanizing him, this report further explains, are that these tactics erode over time when people are confronted by reality—such as the leftist proclamations made that Trump is destroying the United States being confronted with the fact he has done the exact opposite by making it the greatest economic powerhouse in the entire world—that the leftists could only counter by having their media sycophants keep the American people from knowing the truth of. Knowing, too, that they couldn’t keep hidden from the American people forever of how great President Trump was making his country again, this report says, his leftist enemies did everything in their power to defeat him in last week’s 2018 Midterm Election—that quickly became the most expensive midterm election in US history aided by the leftist social media giant Facebook delivering for the Democrat Party a massive purge of over 2 billion Republican Party pages—and Facebook, also, completely eliminating conservative content from being able to be seen by suburban women. 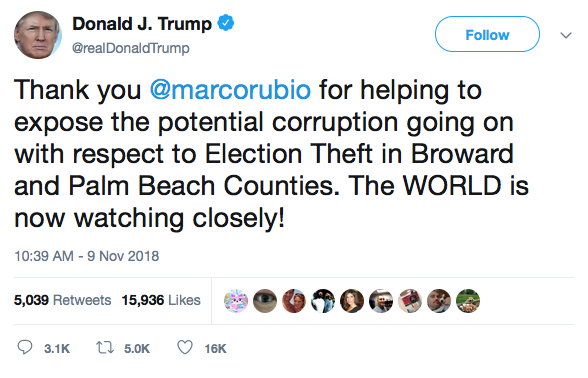 As a consequence of this massive leftist manipulation to defeat President Trump, however, this report continues, the entire world now sees the entire US election system being brought into question as fraudulent and suspicious activity is reported nationwide, and ALWAYS to the Democrats benefit—best exampled in Broward County-Florida where on election night they reported 634,000 votes, but yesterday changed that number to 717,000 as they fraudulently manufactured 83,000 Democrat votes that were documented being rushed in by rented trucks—and was so blatant, a US Federal Judge was forced to declare that what they were doing is unconstitutional. With the world, indeed, watching as these Democrat Party leftists attempt to steal yet another election, this report says, whatever ends up occurring in Broward County-Florida will in no way whatsoever negate that fact that President Trump scored a triumphant victory in this election—as its final result of shows these leftist Democrats only being in possession of a majority in the United States House of Representatives that conveys to them remarkably little power—as the only way they can achieve anything substantial is by their working with US Senate Republicans and with President Trump. The dilemma being faced by these Democrats when they take power in the US House, though, this report explains, is that their leftist base will not allow them to work with either President Trump or the US Senate Republicans—with their, instead, demanding that these Democrats investigate Trump for everything they can think of to throw him out of power—but whose only weapon to do so is a US Congressional Subpoena that, basically, isn’t worth the paper it’s written on as the US Supreme Court has already ruled that a president’s use of Executive Privilege to deny information and documents to the US Congress cannot be violated except under the most extraordinary of circumstances—and whose battles over can last for years, if not decades. 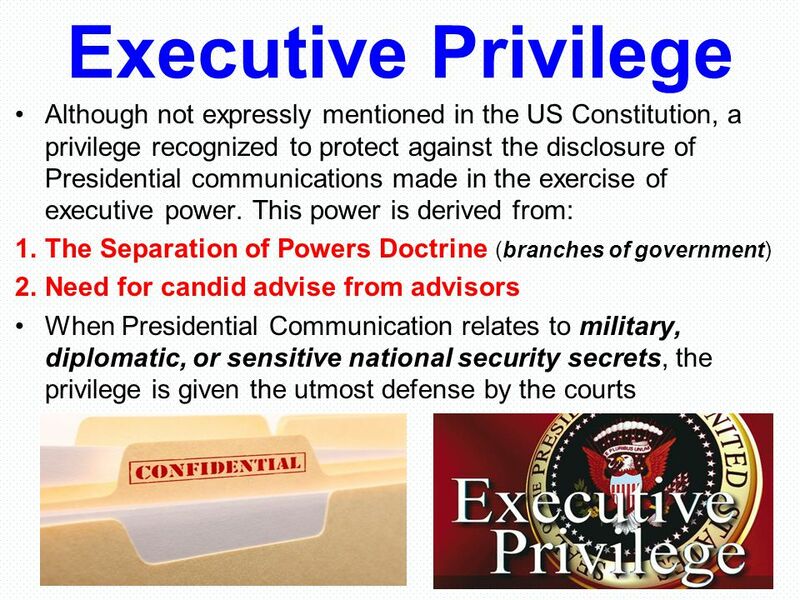 Although not expressly mentioned in the US Constitution, a privilege recognized to protect against the disclosure of Presidential communications made in the exercise of executive power. This power is derived from: The Separation of Powers Doctrine (branches of government) Need for candid advise from advisors. When Presidential Communication relates to military, diplomatic, or sensitive national security secrets, the privilege is given the utmost defense by the courts. By their failing to take down President Trump in last week’s 2018 Midterm Election, this report concludes, these leftist Democrats were further delivered a “reality check” on how near impossible it will be for them to defeat him in the 2020 Presidential Election, as rather than broadening their electoral map, this election showed a return in 2020 to the same, narrow form of trench warfare that marked Trump’s 2016 presidential campaign—a strategic point not lost on Trump, who yesterday ordered White House trade adviser Peter Navarro to tell Wall Street “globalist billionaires” to immediately end their “shuttle diplomacy” machinations in the US-China trade war—nor on the Europeans, who in knowing that Trump now has his leftist Democrat enemies blockaded into irrelevance in the US House, are cowering in fear as Trump’s “wrecking ball” is about to fall on them, too—and as, perhaps, best articulated by the German Bundestag’s Foreign Affairs Committee warning all European leftists that Trump’s “formidable executive powers of the president, notably in foreign policy, remain untouched”—and Leonid Bershidsky, the Berlin-based columnist for the news agency Bloomberg, further warning that the 2018 Midterm Elections “drive home an uncomfortable truth: President Donald Trump and Trumpism aren’t going anywhere”. November 10, 2018 © EU and US all rights reserved. Permission to use this report in its entirety is granted under the condition it is linked back to its original source at WhatDoesItMean.Com. Freebase content licensed under CC-BY and GFDL.